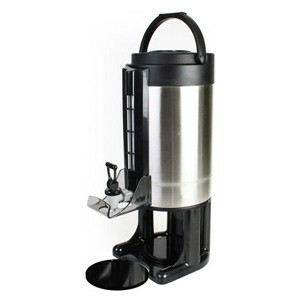 With the Thunder Group ASGD057 Gravity Flow Dispenser with Brew-Thru Lid 1.5 Gallon, you can offer your customers ongoing access to rich, hot coffee. Featuring a convenient carrying handle and a removable base, this coffee dispenser is ideal for restaurants, cafeterias, convenience stores and catering companies. This airpot is manufactured from stainless steel, so it is rust-resistant and retains heat for up to six hours. In addition, it has a brew-thru lid that ensures your customers will receive the freshest, most flavorful cup of coffee possible.